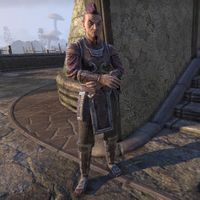 Gwinadras is a Bosmer fighter who can be found on the Canton of St. Olms the Just in Vivec City, at the bottom of the stairs, talking to Horulia Agrudilius. He has no unique dialogue. This page was last modified on 27 April 2018, at 23:57.